Geraniums are one of the most common flowering plants grown by homeowners and do well not only inside the home but outside as well in planters, window boxes, garden beds, and hanging baskets. Plants are very easy to grow and can be started from seed or you can purchase plants from a local retailer. The large, circular, brightly colored flowers on geraniums bloom from spring through until the first frost and plants emit a distinctive fragrance many people associate with summer. When given plenty of sunlight and warmth they flourish. 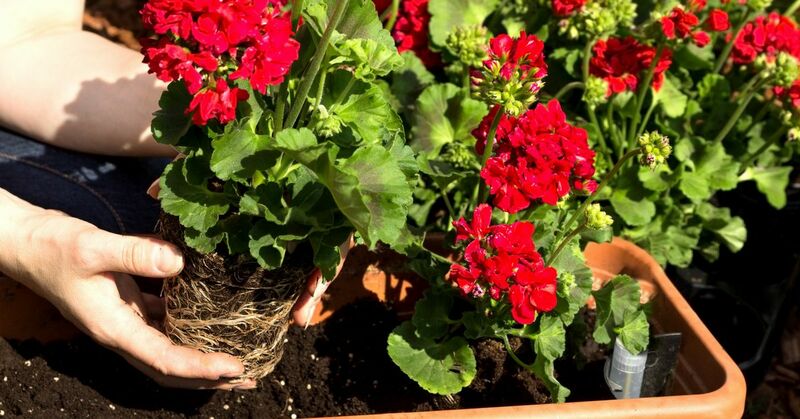 These plants will handle conditions where there is moderate exposure to sunlight, but to get the most blooms out of your geraniums its best to plant them -- or put the pots -- in a sunny location that receives 6-8 hours of direct, unfiltered sunlight daily. Many types of geraniums are heat and drought tolerant, which certainly adds to their appeal to homeowners. When watering your plants its best to let the soil dry out to a depth of 1-2" before giving them a good drink of water. Try to water the soil around the plant, keeping water off of the foliage and flowers. Geraniums have the tendency to get tall and "leggy" if left to grow unattended. You can pinch off the tops of the stems where the main growing points are to encourage the plant to become more bushy and full. The science behind why pinching off the tops of plants makes them bushier can get technical, but DenGarden helps to explain it in simple terms. The best way to encourage continuous blooms throughout the growing season is to regularly deadhead spent flowers. This simply means removing the dead flowers by cutting the stem above the first set of leaves. As the old flowers are removed it will trigger the plant to form new buds. Fiskars talks about the how, when and why of deadheading if you're interested in more details. Due to their quick growing nature, geraniums should be fertilized regularly to promote vigorous, healthy growth. Add fertilizer about every 2-4 weeks at a rate of about half of what is recommended on the label and water it in well. If your geraniums have spent the summer outside, and you live in a colder climate it's possible to bring them indoors for the winter to keep them growing. Before the first frost dig up plants and cut their stems back to 6-8" long. Then transplant into the smallest pot possible, and keep in a shaded spot for about a week. After this time lapses set the plants someplace where they can get lots of sunlight inside your house. When the weather perks back up in spring move them back outside after the chance of frost has passed. Not every one of these ways to protect your garden from pests works equally well. And no single tip will work on every pest. But by experimenting, you can find the right combination to keep your garden nearly pest-free.